I know I say this every week but I really LOVE this mini style outfit. The Denim Pinafore gives me all the heart eyes. Rosalie is 2 and a half now and I feel like I have finally found her style. This outfit I would say sums it up. Rosalie’s tights and denim pinafore are both from Next. The pinafore is actually in size 12 – 18 months but miraculously it still fits. I find denim pinafores so versatile. It’s something you can wear again and again . You get a completely new outfit just by changing up the tights and top underneath. Rosalie’s stripey top is from h and m. It’s such a good basic item and goes with so many things. Rosalie’s boots were an ebay find. They are fur lined so nice and cosy. Rosalie has worn them so much this winter as they seem to go with everything. They also fit her really well. 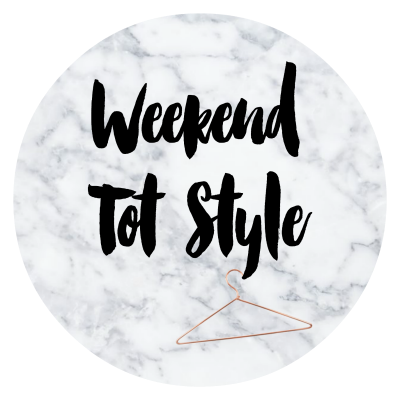 We are linking up with this week’s weekend tot style. If you’d like to link up head over to This mama life. Oh she looks so cute in that! I love denim dungarees, so these are like that.